LAS VEGAS -- Kicking off on Tuesday in Las Vegas, the world’s biggest information technology tradeshow, Consumer Electronics Show 2019, is to showcase significant advancements in consumer electronics technologies led by “smarter” artificial intelligence that will be supported by a new fifth-generation network. AI and 5G are expected to take center stage at the annual tech event, with an increased number of connected devices such as TVs and other home appliances, according to the Consumer Technology Association, the host and organizer of the tradeshow. More than 4,500 exhibitors from around the world, including 1,200 startups, will set up booths for four days across more than 250,000 square meters of exhibition space. South Korean tech giants Samsung Electronics, LG Electronics and SK Telecom along with their affiliates are ready to join the show, equipped with some newest consumer technologies for the year. In a teaser released on Thursday, Samsung said it will showcase innovative ways that its latest AI and “Intelligence of Things” technologies simplify daily life. “These include brand new applications for AI and IoT, new ways to make AI do more as well as new devices that place AI and IoT at the center of users’ connected lives,” the teaser said. Kang Jeong-hyun, a senior research fellow at market researcher Euromonitor International Korea, said a talking point at CES 2019 will be that voice-controlled smart devices will further evolve to realize smart home. Both Samsung and LG will be sparring again for the leadership in the global premium TV market by introducing the world’s biggest and highest-definition TVs. 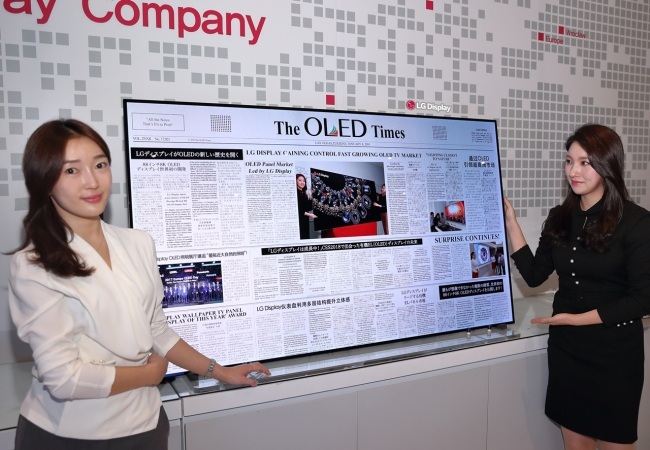 While Samsung is going to present the year 2019 version quantum-dot light-emitting diode TV in 8K definition, LG is to confront Samsung’s QLED technology with its 8K organic light-emitting diode TV technology. 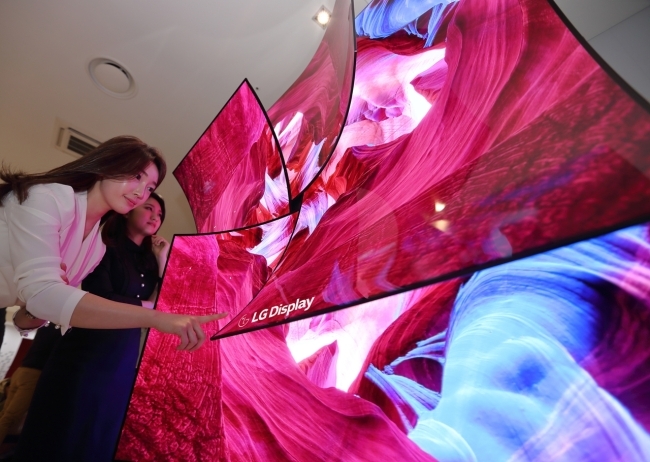 LG Display, the world’s largest OLED panel maker, will present 8K OLED panels in 65 inches and 88 inches, boasting what it says is the highest level of picture quality. While Samsung is not expected to unveil a new mobile device at the Las Vegas show, LG and Japan’s Sony are announcing new mid-range phone series. China’s display startup Royole is grabbing attention with its announcement that it will unveil the world’s first foldable display smartphone, FlexPai. 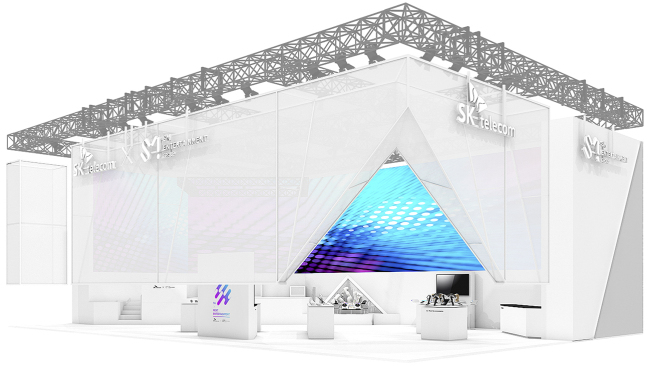 SK Group’s affiliates – SK Telecom, SK hynix and SK Innovation – are taking part in the CES for the first time to seek new growth businesses in the field of mobility and media in the 5G era. Together with Korea’s biggest entertainment business S.M. Entertainment, SKT will set up a booth for next-generation media content with 5G, such as a virtual reality-based karaoke platform called “Social VR X Everysing,” where multiple users can enjoy karaoke in virtual reality. SKT’s Holobox – a hologram technology connected with its voice assistant NUGU – will also showcase next-generation communications with 3D characters. 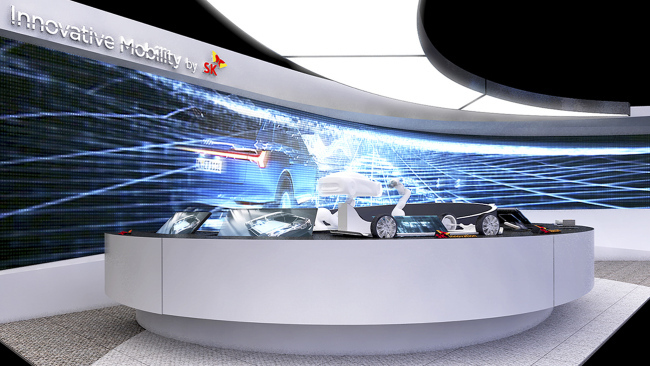 In collaboration with SK hynix and SK Innovation, the mobile carrier is also set to open its core technologies for autonomous driving at another booth. SKT will unveil its lidar system that uses sensing technology developed by Switzerland-based SKT company IDQ. The system, which effectively acts as the “eyes” of a self-driving car, allows a self-driving vehicle to detect objects over 300 meters away. The company will also show an updated technology for high-definition maps that analyzes new traffic information collected and collated from cameras in cars in order to make a better driving decisions. According to CTA’s Market Research report by Vice President Steve Koenig, there are five key trends to be watched at this year’s show, including 5G, AI and car automation. 5G that is 20 times faster than the current Long Term Evolution network is expected to be a bigger topic at CES 2019 as some new gadgets enabled by the new bandwidth are to be announced. Carmakers would dominate the CES 2019 as they are expected to showcase more developments in car automation, the researcher pointed out. AI will be more powerful, as it is to be embedded into many more devices around consumers and shift around their behaviors, redefining the Internet of Things as “Intelligence of Things,” Koenig said. In 2019, augmented and virtual realities will march on for different audiences, the research noted. AR is expected to be utilized more in business to provide workers with easy-to-view information. VR is likely to increase its presence in the consumer market as more and more people start to buy headsets and companies are on track to increase VR experiences for customers. And finally, the CTA research is predicting that technology will be harnessed to enhance medical practices and bring about positive changes to the people. Digital therapeutics will take up a significant portion of CES 2019, with an influx of new medical technologies to be unveiled. The CES 2019 will also feature other themes such as blockchain, cybersecurity and esports.